Bike Extreme Freeis a racing game for Android devices by GameTop.com. With 9 levels to traverse through, and super easy controls, Bike Extreme Free is a great game to have on your device, especially if you have a need for speed, all for the price of free. Bike Extreme Free is simple enough: 9 levels, with up to a 3 star rating for each, based on the number of coins you can catch while cruising, jumping, and flying through the air. The gameplay is simple enough with tap controls for forward, reverse, leaning forward and backwards, and a “turn around” control. The graphics and sound are pretty basic, but considering that the game is free, it isn’t too bad. The controls can be a little fickle at times, and it can sometimes feel nearly impossible not to wipe out on the pavement (or the roof of the car, or the ramp). The music gets very repetitive, very quickly, so thankfully, you have the option of turning it off. You also have the option of only turning off the sound effects, as well. The concept of a bike racing game is nothing new, and while Bike Free Extreme is hardly innovative, it’s fun enough and made well enough to keep you entertained. 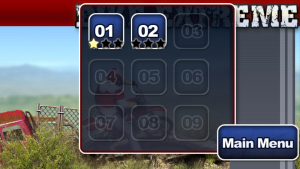 Despite it’s shortcomings, Bike Extreme Free is just challenging enough to get you hooked into beating all 9 levels with as many stars as possible. It won’t keep you entertained for weeks, but it’s an easy Android boredom solution for the morning commute, or for the cranky child in the backseat. While pretty unoriginal, there’s still something to be said for he simplicity of the controls, and the basic, uncomplicated graphics. Bike Extreme Free for Android is a great value though, and I applaud GameTop for their level of quality in their free games. 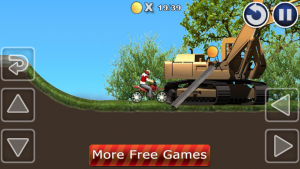 Bike Extreme Free is free from the Google Play Store and can be downloaded on any Android device with Android 2.2 or greater.